Zealotry and Academic Freedom began with the author's personal experience with suppression of academic speech and obstacles to the pursuit of academic quality. Using his own tumultuous experience as a starting point, Hamilton explores how significant efforts to create an autonomous space for academic speech within the university over the past 125 years have been thwarted.Hamilton charges that a fundamentalist academic left in some humanities and social science faculties views the exercise of standards of academic quality and merit-based performance evaluations as tools of oppression and bigotry. Academic zealots ferret out and oppose hidden structures of so-called oppression in our "Eurocentric" culture. Any faculty member overtly supporting academic quality is thus suspected of bigotry and subject to investigations.The opening portion of the book locates similarities with the religious fundamentalism of the nineteenth century in waves of zealotry in American higher education. The first part covers student activism in the 1960s through the emergence of a radical academic left in the early 1990s. The second part examines the meaning of academic freedom and the protection of expression that should be secured. 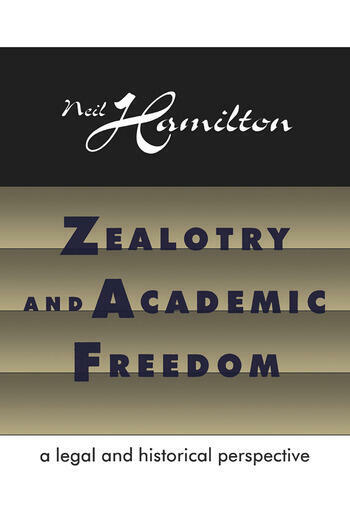 The third and final portion shows how targets of the coercive tactics of the zealots in any period of zealotry can, and have been effectively rebuked, and ultimately overcome.Neil Hamilton's book will generate controversy, particularly the chapters that inquire into the current wave of academic suppression. Hamilton warns that "history instructs that it can happen here." This candid look into the politics of higher education will be gripping reading for all those concerned with the future of education: professors, administrators, students, and parents. There has been a growing literature on this subject, but none cover the legal-political aspects of political correctness with such precision.